Stock #5308:14k Yellow Gold or 14k White Gold Channel Set Cubic Zirconia Anniversary Ring, Eternity Style (stones go all the way around)... 2 Carat total weight, Gorgeous, Top Quality, Russian CZs!!! 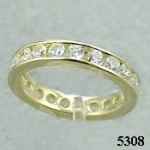 Nice, traditional style eternity band that will match almost any solitaire ring. This item is not in stock and will take 4-6 weeks for delivery.